Topics: Signage Services, Portfolio, · Channel Letters, · Exposed Neon, and · High Rise Signage. 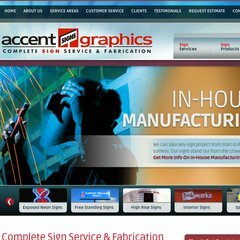 accentgraphicsinc.com Contact Accent Graphics, Inc.
On average 1.30 pages are viewed each, by the estimated 19 daily visitors. thecybercom.com Website Business Optimization Services | Small Business Website ..
Magratech (Florida, Deltona) is the location of the Apache/2 server. PHP/4.3.9 is its coding language environment. It has 3 DNS records, ns.accentgraphicsinc.com, rs1.magratech.com, and sb1.magratech.com. PING (74.205.65.120) 56(84) bytes of data.